Puebla Mexico (pronounced pleh-blah) is located in the Valley of Puebla, surrounded by volcanoes and snow-capped mountains, 68 miles southeast of Mexico City. 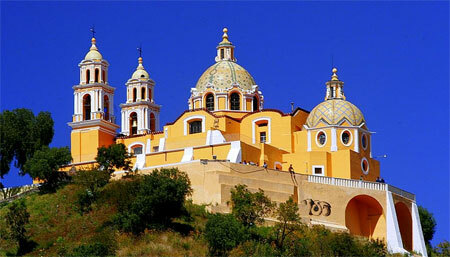 Puebla is the capital of the state of Puebla and one of Mexico's oldest Spanish cities, founded on April 16, 1531. According to legend a band of angels appeared to Bishop Julian Garcias and pointed out where the new city would be built, hence the name "La Puebla de los Angeles" or simply The City of Angels. Puebla was the first city in central Mexico founded by the Spanish conquerors that was not built on top of the ruins of a conquered Aztec or Mayan settlement. Its strategic location, half-way between the port of Veracruz and Mexico City, made it the second most important city during the colonial period. The city's main claim to fame, however, is Cinco de Mayo, a festival commemorating the May 5, 1862 defeat of a French expeditionary army by Mexican general Ignacio Zaragoza. It was after this battle that the name of the city was changed to "Herica Puebla de Zaragoza". The city of Puebla Mexico is also famous for its cuisine; two of the best known specialties originating here are mole and chile poblano. The city of Puebla is the home of authentic Talavera. Talavara is a very special type of hand decorated high-fired ceramic product that was introduced to Puebla by Spanish Monks in the 16th century. Talavera pottery and art can be found in almost every shop, church and even several streets are lined with Talavera tiles, hence the nickname "The City of Tiles". In order to keep the highest quality the Mexican Government has decreed that the use of the name Talavera be protected and limited to a geographical area in and around the city of Puebla. Puebla is an important industrial, cultural and educational center with more than 5,000 colonial buildings, which are mostly baroque edifices built during the 16th century. The Cathedral is one of the most notable examples of this city's beautiful architecture. The city of Puebla is also an important center of learning, counting three major universities and several specialized institutes of higher learning. It is said that it is one of the best places in Mexico to learn Spanish and immerse yourself in the Mexican culture. Puebla's rich history and culture can be seen in it baroque, renaissance and classical architectural styles. In 1987 the entire city was declared a world heritage site by UNESCO, to help preserve it's Spanish architecture and ambiance.